Most web applications such as twitter, dropbox, facebook, google+ have their own custom APIs, and if you want to share information with these web applications, or make use of the services they provide (e.g. store a document in dropbox) you have to use those APIs. The share button used on this site for instance makes use of all the services specific APIs to share information. If one of the interfaces should change, a new version must be created. On android there is something called intents, which is a standard way of apps to share information that avoids all these problems. Instead of requiring tight integration the application that wants to share something just asks the system which apps can fulfill the request. 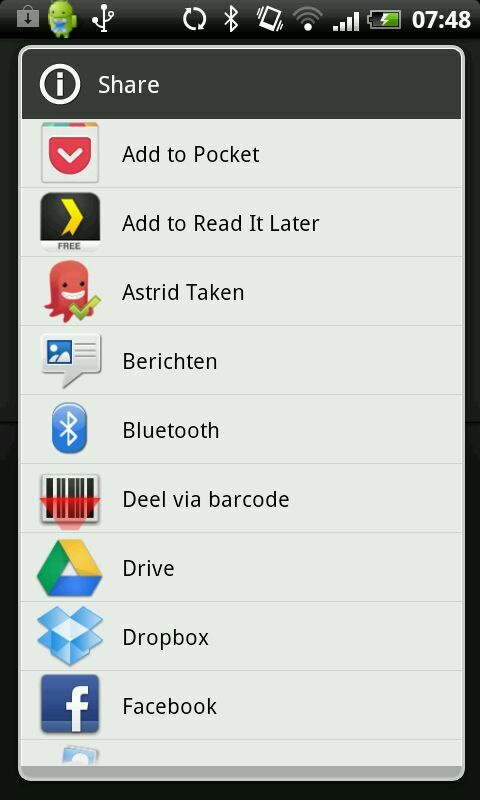 The system returns with a list of apps the user can select and that's it. The data is sent exchanged between the apps, without requiring custom integration. Wouldn't it be nice if we could have something like that for web apps? No more need to support 30+ different bookmarking sites, 20+ social networks and 15+ picture websites. Just one simple way to exchange information in a standard manner. Well, we can. 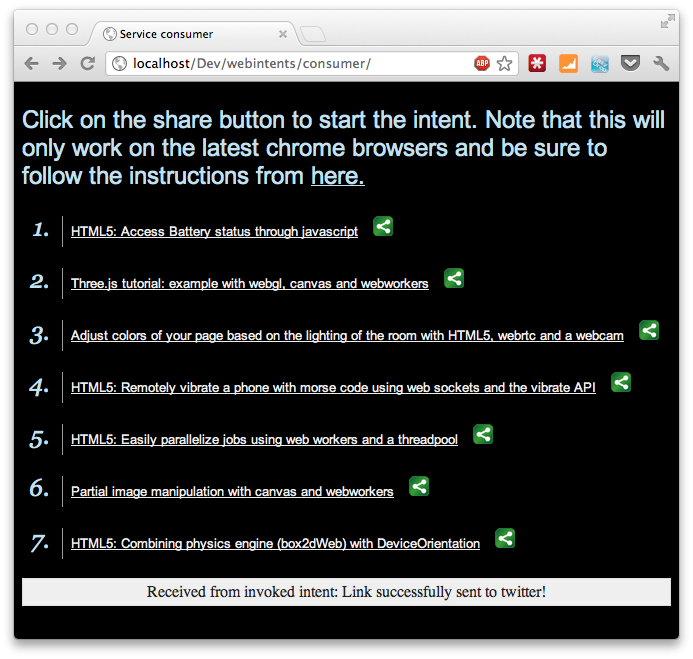 Or better said, we'll be able to do this soon across browsers. Web intents is a new W3C specification proposed by google, to bring the goodness of Android intents to web applications. In this tutorial I'll show you an example how to do this. I've also put the demo online here if you want to test for yourself. Before this will work however, you need to add a chrome extension that registers for this intent (more information in the rest of the article). If you download, extract and install this archive in chrome the example will work. How to do this is shown at the end of this article. But first we look at the website that wants to share information with other websites. // that is called on succes. As you can see, the button is just an image. We use jQuery to add an onClick listener. This onClick function is where we create the intent that we want to start. In this case it's the share intent, and as the data we provide the url of the link. There are many more intents available, and you're free to use your own. It's however a good idea to use those from webintents.org, since those are standard and used by many other applications. In this small code fragment we also add a callback when the intent as successful. In this example we just show the result in the grey box at the bottom. This is all you have to do at the client side. Just specify the type of intent you want, and let the platform handle the rest. The other side of web intents are services that can handle these intents. 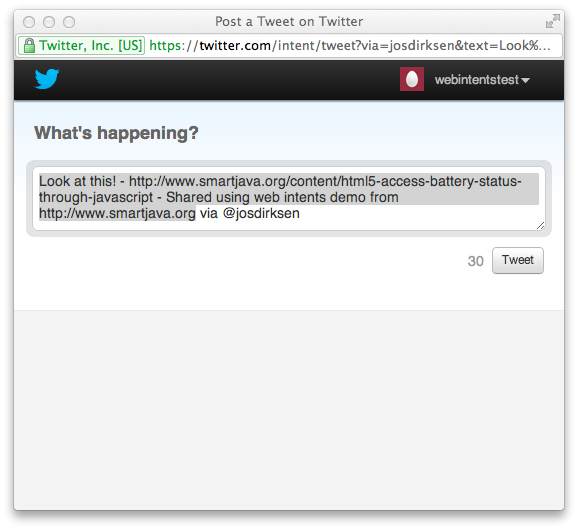 In this example we create a simple service that forwards the URL to twitter to be shared. // this event is called when the tweet has been sent. // this means we can send the result back to the client. Here you can see that we create an url based on the data from the intent. From our client we sent an url, which we use to create an URL that we can use to directly post to twitter. After we've created the twitter url, we register the callback from twitter. So as soon as the tweet is sent, the callback is called, and we can pass the result back to our client. So far we created our client, and a service. But how does chrome now of the existence of our service? What chrome does now is that it checks whether there are services registered in the chrome store that can handle the intent from our client, and it checks whether extensions are installed that can handle the intent. Since we don't want to submit apps to the store just to test web intents, we'll create a simple extension that we install locally. 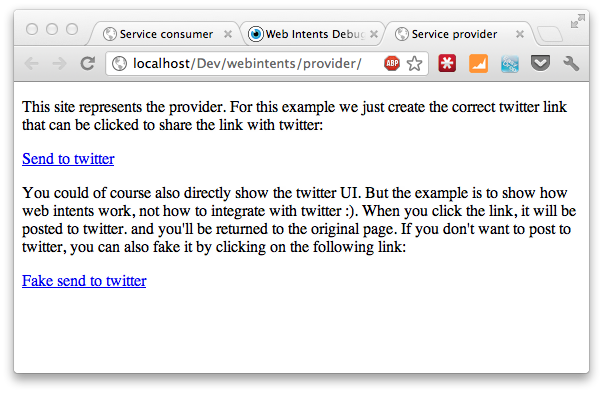 I won't go into the details of the manifest, since there are many articles that explain how to write chrome extensions. What is interesting here is that we can now add an "intents" element. This element specifies the type of intent we're interested in. So with this configuration we tell the platform that we can process "http://webintents.org/share" intents and know how to handle text/uri-list types. 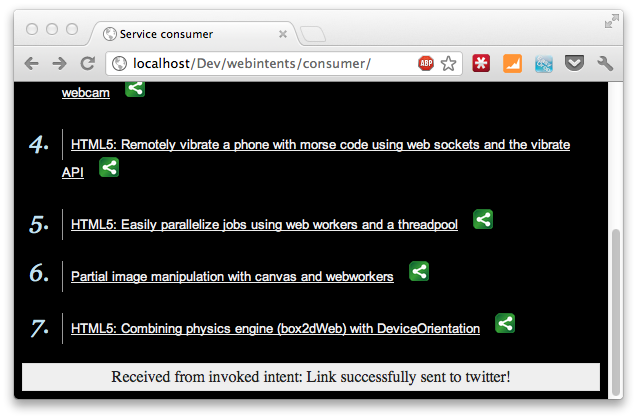 When we receive such an intent we open the supplied href, which points to the web application we discussed earlier. And that's it. 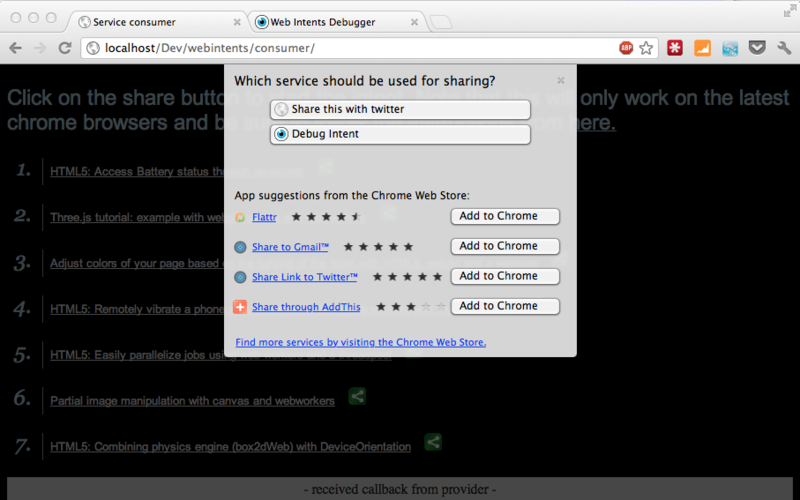 We can now use the chrome web intents functionality to share information just like we do on android devices.